As usual, the Third Thursday recap only scratches the surface of the knowledge and expertise shared. This month is a rapid-fire recap of the tip and tools from our authors. Recognize and honor your unique writing and revising style. Are you a plower or diamond polisher? Do you plow through your draft or polish it as you go. Are you an outliner or not? Maybe both, depending on the situation. Get feedback from other readers and other writers. Readers and writers can offer different kinds of feedback. Scrivener, word processor on steroids – and then some, was recommended. Carry a notebook for your current book and record ideas on characters, plot, etc. Use Pintrest to build boards around your characters, settings, themes, etc. Research tip – avoid the Google abyss by stopping your search after finding the one factoid you’re looking for. Let your draft rest, then come back to it with fresh eyes. Take your time on revision requests from editors or agents. Don’t sacrifice quality for quickness. Remember it’s ultimately your story. Consider the feedback from others, but retain ownership of your work. Follow editor or agency guidelines for formatting. Don’t double-space manually. Write in single-space mode (usually the default), then highlight the entire text and format it with double-spacing. Use the help in your word processing program if needed. Use a professional, non-family email for professional correspondence. Save your UnicornGirl@gmail address for your friends and family. Suggested fonts are Times New Roman and Courier. Display your style in your writing, not your fonts. If you want to write your draft in a font that inspires you, go for it. Just remember to change it before submitting your work to an agent or editor. When you are ready to consider hiring an editor check out Yellow Bird Editors, the editing home of all of our panelists and our moderator. If you’re in the Austin area, join us at August’s Third Thursday. If you can’t make it, we’ll see you next month on the blog. Thanks to everyone who stopped at our booth this weekend during the Texas Book Festival! For all those new faces, it was a pleasure getting to meet you, and for all of our members and friends who came by, it was great seeing you again! This weekend was a huge success, especially for our author members who signed books at the booth and for our two staff members, Cyndi Hughes and Bethany Hegedus, both of whom participated in some panels! 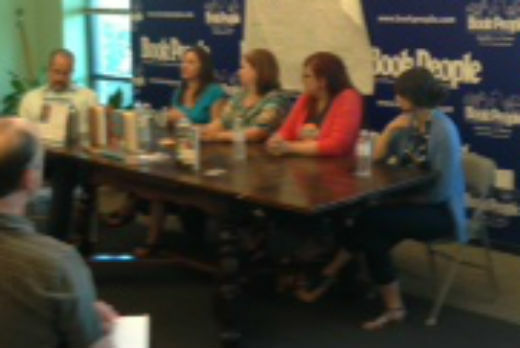 The Bookish Brunch also was a hit! Authors H.W. Brands, S.C. Gwynne, Bethany Hegedus, James McGrath Morris, and René Saldaña, Jr. were wonderfully entertaining and the food provided by Frances Townsend, Ted Gilman, and Kerbey Lane Cafe was delicious. Many thanks to BookPeople for selling books at the event as well. As promised, here are the best of the writing prompts that we featured at our booth this weekend. The craft landed in front of me and Larry, the eerie blue glow of its underside illuminated his face where I saw trepidation and excitement at what awaited us. He stood quietly, as if waiting, and I watched as he began to sweat bullets. He realized I knew who he was and what he’d done.